This easy shepherd’s pie has two variations: the classic 2-crust shepherd’s pie recipe and a Whole 30, gluten free shepherd’s pie option! Make it for dinner tonight! 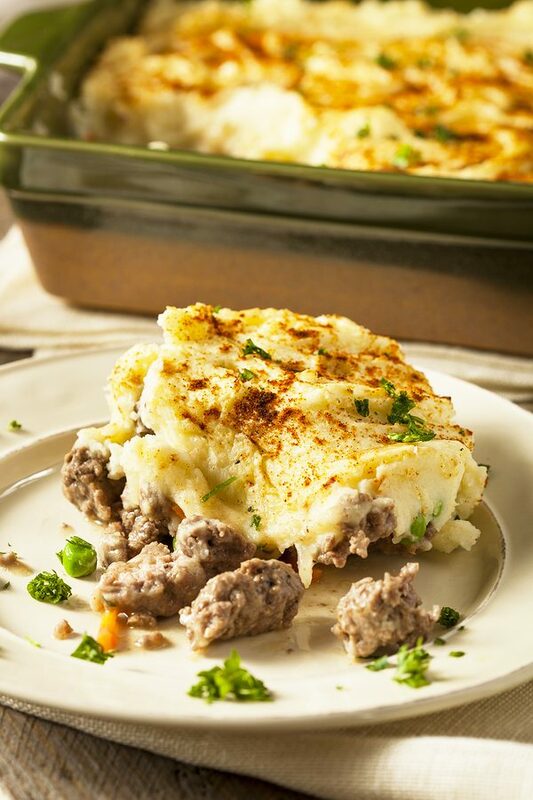 We traditionally make this classic shepherd’s pie with the double crust. 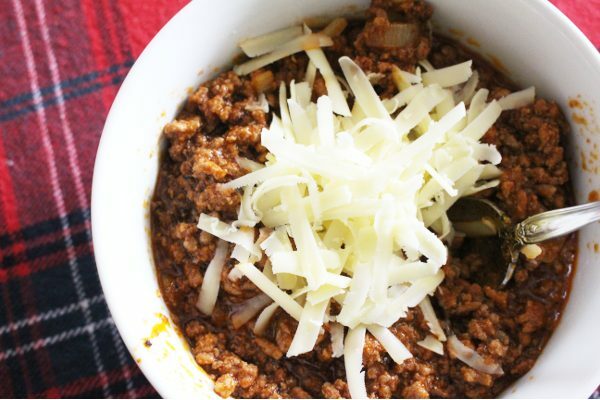 However, when we are doing a cleanse, or cutting down on carbs, or if I’m just wanting to make a super fast dinner, this is still our go to easy shepherd’s pie recipe! Filled with sauteed meat, onions, carrots, and peas, then topped with creamy mashed potatoes, this shepherd’s pie recipe is perfect if you are in a hurry, doing Whole 30, or just need a gluten free shepherd’s pie option! Besides just being a delicious, easy, and filling dinner, I love that this recipe freezes so well! That allows me to make this in bulk and pull it out when I need a fast dinner. I usually keep about 8-12 of these in the freezer at a time. You can freeze them in single portions the same way I freeze mashed potatoes (see the tutorial and video here), or you can freeze them in family size or pot luck size portions! It’s good to note that this is considered a classic shepherd’s pie here in the South. A British traditional shepherd’s pie doesn’t have a crust. You can skip to the Whole 30 variation for an old world classic shepherd’s pie. Grab your favorite pie crust recipe (for 2 crusts), we go back and forth between my great-grandmother’s pie crust recipe and my new sourdough pie crust recipe. Of course, a store bought crust works as well! 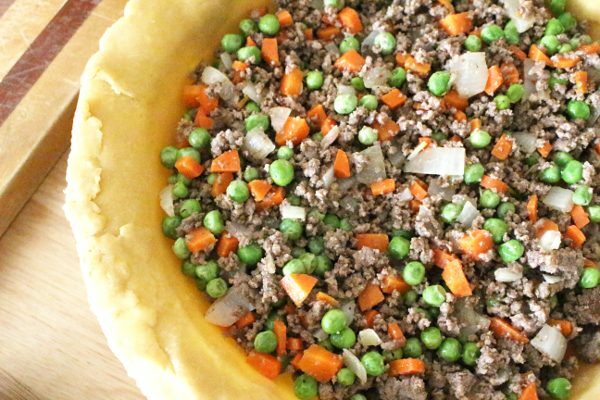 Place the bottom crust in a deep pie pan or casserole dish, layer in the meat and veggies mix, then add a thick layer of mashed potatoes on top. Don’t be afraid to really pile it on, making the pie really mounded up! Then add the second layer of crust on top. Fold the edges down and crimp with a fork to seal. At this point, I like to freeze the whole pie for about 15 minutes before baking. But this is optional, so if you are in a hurry, skip this step! If you aren’t doing Whole 30 or need this to be gluten free, a side of sourdough bread is an amazing addition to this already fabulous dish! This dish comes together quickly and uses only whole foods. The depth of flavor present is delicious on it’s own, or paired with a side salad or sauteed spinach! 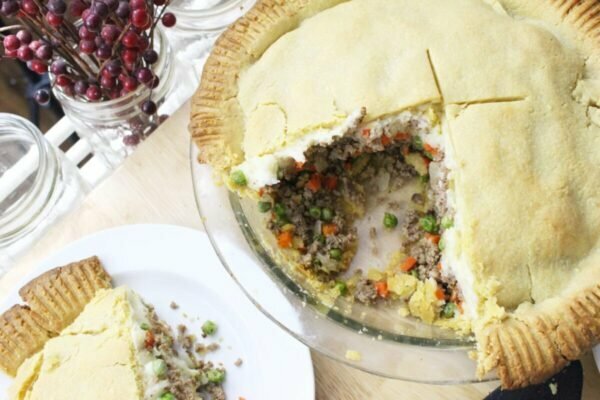 For this Whole 30 and gluten free variation, simply omit the crust and fill a deep dish pie pan or casserole dish with the meat and vegetable mix, then top with mashed potatoes. You can bake at this point if you want, but if all your ingredients are hot upon assembly, you may not need to! Pair this with a salad and a drizzle of homemade ranch dressing for a delicious dinner any time! I like to buy these 2 cup aluminum containers for individual portions that come with paper lids. They are easy to label and stack nicely. Order the 2 cup containers we use here. You can also buy larger family and pot luck size containers too. Just note that the heating time for larger portions will be longer than a smaller individual frozen portion. Generally, an individual portion heats fully at 375° for 30-40 minutes, where a family size or pot luck portion (think lasagna tray sized) might take 55-90 minutes depending on the size. If you don’t want to buy the containers, you can also just mix all the ingredients together (instead of layering) and then dollop big scoops onto a wax paper lined tray. Freeze the piles for about 4 hours, then transfer to a gallon baggie. See how I do this with mashed potatoes here. A classic, easy shepherd's pie recipe with Whole 30, gluten free options! Serve with salad and/or crusty bread (if desired)! Boil potatoes until tender. Mash potatoes with butter and milk. Add salt and pepper to taste. Meanwhile, brown the meat and onions. Salt, pepper, and garlic to taste. Add carrots once meat is browned and cook for an additional 5 minutes, stirring often. Add peas once carrots are softened. 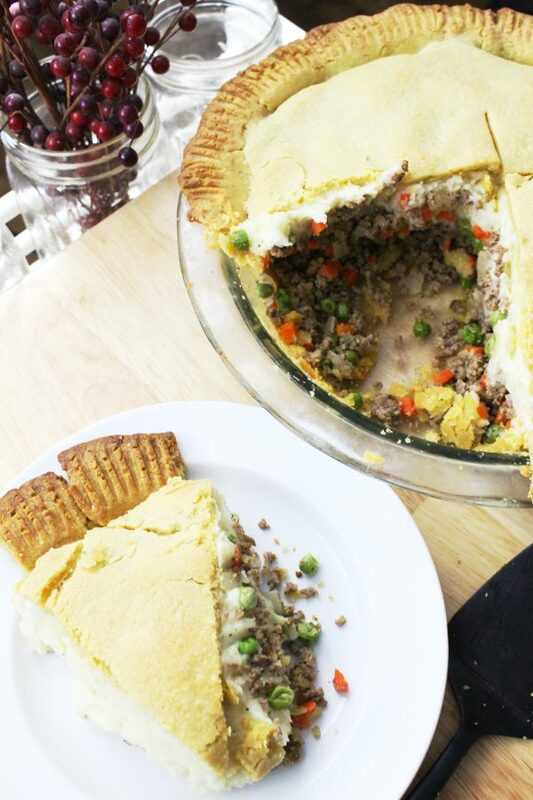 Fit 1 pie crust into a deep dish pie pan, or casserole dish (omit for Whole 30 or GF). Spread meat into a 8x8 casserole dish or deep dish pie pan and top with potatoes. Top with second pie crust (omit for Whole 30 or GF). If using pie crust: Bake for 15 minutes at 425° or until crust is golden brown. To freeze: Place in an aluminum pan with paper lid. To reheat: Thaw overnight in the fridge and bake on 375° for 30 minutes OR place directly into cold oven from the freezer and heat to 375°. Bake for an additional 45-60 minutes. Oh that looks good:) I’m not a top crust kinda guy when it comes to Shepards pie, but I think I could make an exception on your recipe. Aww, thanks! I hadn’t made it with any crust at all until recently, and it was so good I think I’m sold for life. Ha! Let me know if you try it! So do you cook the whole thing with crust before freezing? Or freeze and then let the crust cook while the rest is warming? Also, recipe talks about (and photos show) an 8×8 casserole but in #5 of the instructions, it specifies a 9×13 casserole dish. Is one crust recipe enough for top and bottom of a 9×13? Is there enough filling for a 9×13? And, back to the freezing part (again). I want to do some individuals in those pans you linked to. Do I just cook it, then spoon some individual portions into the pan, then freeze? Sorry for all the questions. 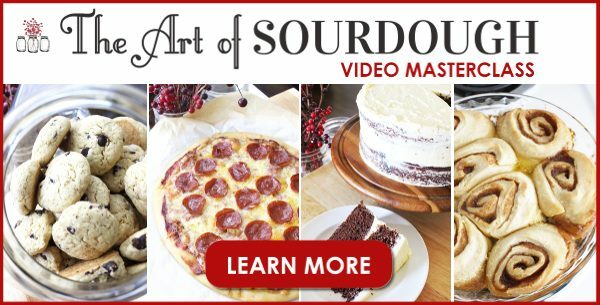 Oh, and I am definitely doing that crust! Anytime you have a great-grandma-tested recipe, I’m in!! Ok, let’s see. If freezing, I make it in the dish I will be freezing it in, bake it fully, then simply reheat when ready to eat. The casserole dish size was a typo! I have updated it, thank you! I put that in as a placeholder then forgot to update it :-) Should be an 8×8 casserole dish or a deep dish pie pan. And for the individual portions, I make the dish in the pan, bake, and freeze. I like doing the non-crust version in the mini sizes (mix all ingredients and just spoon in before baking), but either way works and is delicious!